I mentioned last week that one of our big Fall projects is to redo Millie's room. 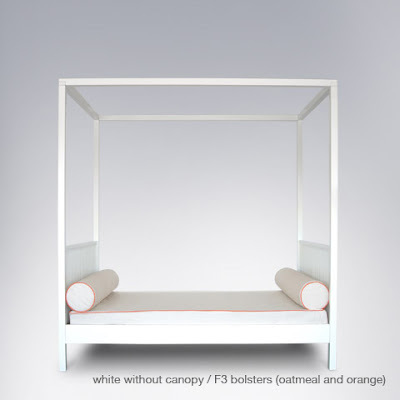 After much searching, we found a perfect full size "canopy" bed (below) that we planned to place across the back wall to mimic sort of a groovy, pseudo daybed. (The room is small, so I don't want anything too large jutting out into the middle of the space.) But, the bed we love is pricey...way pricey -- like almost as much as my first car pricey. So Bryan is going to build it! Sweet husband. First up, the print below, spotted in last month's Cookie. I'm am a little nervous that the background looks cream in the photo below, and I tend to skew a bit more modern. 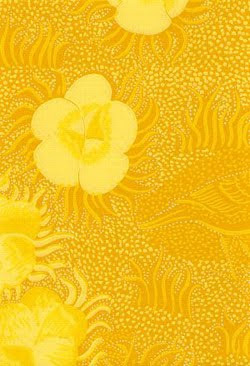 But the size of the flowers seems to make an otherwise traditional print feel a little cooler, so it could work. Can you tell I'm wavering?? Ok, onto option #2. The Dotswold from Anthropologie that made Audrey's "loving" list. I totally dig this wallpaper -- It's fun and festive, it would look good with the purple walls, and, well... it's just all-around cool. BUT, I would have to totally change up the color scheme, kill all the yellow and get a new rug + the vibe of the room changes from soothing to sort of crazy, and I'm a little worried that the pattern might end up giving us a headache. Then there's option three. It's the longshot, but it intrigues me. It's vintage Finnish paper, and I totally LOVE the pattern. It would definitely go with the existing colors, but yellow would become the star of the room... not sure if that's what I want. Typically I feel pretty confident and decisive about decorating stuff, but for whatever reason this project is vexing me (maybe I'm losing my mojo a bit) so I need your help. Which one do you like...? Great idea... and what a husband you've got! Quite the handyman! The first wallpaper choice for sure. If it were something else, say a pillow, or even a paint color, I would choose something more colorful. But wallpaper is not an easy re-do and I hate taking down wallpaper. But maybe I'm boring? Anyway, good luck and I can't wait to see it!! I would say Option 2 or 3. The first one, well, it seems very grown up...like it would be better in a sitting room. Are you planning to do the whole room or one wall. I think it could be better on one wall but I think the others look more like a little girl to young girl's room. The bed is a great idea. I had a daybed and loved it. I love room redos! I love all your choices and see your quandary. Personally I like 2 and 3 but for a restful room I'd suggest 1. It's the most nuetral and can grow with her. The others are bold (which I love) but may not be the soothing feel that is lasting. I don't know your entire design, but could you incporate #3 into a bookshelf or something else subtle in the room? Just a thought. Good luck. I look forward to your progress updates. #2!! Haha i just love it and think it would look amazing behind that bed. Plus what a FUN room for a girl! I don't think it's too childish either - I'd use it in my own home if I wasn't a renter! i like #2, but it might seem a little loud after awhile. i think that #1 is a bit more soothing. i would like #2 in my house, maybe i need a room redo. Personally, out of the three, I would go with number 1, I love the other prints but they are not very restful and I feel like they would overpower the space. I agree with Pittsy, maybe you could incorporate a piece of number 3 somewhere else in the room? the bed is awesome too. could your husband make ME a bed? i'm going through a yellow phases right now, so i think yellow center stage would be fantastic and love this with lavender. but still...2 is just so fun and pretty and cool and girly and awesome. Wallpaper # 1... I mean wallpaper #2. #1. #2. #1... can you go wrong with either? Cannot wait to see what you choose. I love the 2nd one, the anthropologie one. 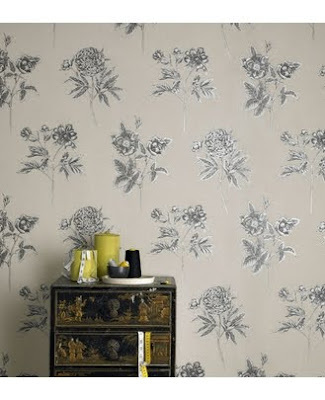 Even if you just have one wall-papered wall and the rest plainer, it will stand out perfectly! Can't wait to see the after. love the first. It will make changing her room later much easier and it's pretty. Can't wait to see the bed too! I like all the wallpapers but do feel they are all a little grown up. And once you start putting all the little creations on the wall it will get busier. What about keeping the wall color and putting a nice stenciled design on it???? I have done that twice (first time ribbon pattern with dangling bows - monochromatic - and second flowers and twidly bits - lots of color) and loved the effect. It makes the wall more interesting but doesn't suffer from over busy. Just a thought. I love all three, but I can totally picture the girly-yet-modern room you would design around #1 (and I could see her loving it forever). Ditto Pittsy. But that said, my room growing up was a soothing sunny yellow with the windowsills (which were *deep* in that house) painted a periwinkle/lavender color and I adored that space. If you go with #2, I think the person who framed the pieces had it right. 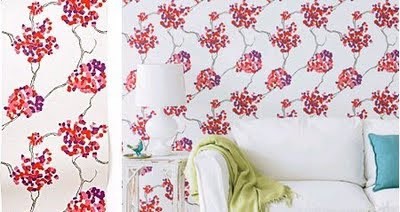 It is a fabulous print, but for a relaxing haven vibe, it's too much. Ooooh,so many choices. I'm loving 2. My best friend growing up had one wall with a repeating rainbow print wall paper and the other walls were light purple. It was awesome. Great for staring off into space and daydreaming. I guess I am leaning to the more bold choices. And I love the bed. Just a few things I've been watching for my own house :) Looks like they could work for you too! Love, love, love the one from Anthro. Also love the vintage Finnish one, but think that it might be a bit too much . . .
Love all 3 but especially love the 2nd one!! Definitely #1. It's beautiful and the others seem too loud for a bedroom, which should be soothing. They're all very lovely choices, but I like #2 the best! i'm having a hard time deciding things too! 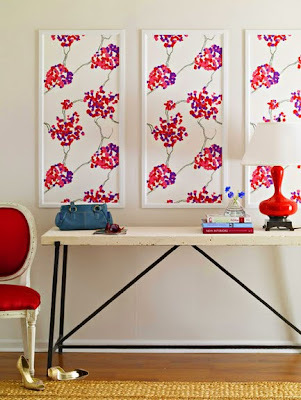 LOVE the idea of the framed wallpaper -- i bookmarked that idea too. love all your choices but especially love 1 + 2. so cute. I would go with Option 1. I really do like option 2 but I agree that you may get tired of it too soon. Option 1 will allow you to go with the current vibe but, change it up a bit. Love it! I vote Dotswold... Works with the color of her room already and it's so great! I love all three, but I'm going to have to vote for 1 or 2. The wall behind a bed needs to say that this is a great place to sleep (or read -- which I think is what my son's blue sky with fluffy clouds wallpaper says). I vote wallpaper #1. It strikes a nice balance between traditional and modern. I like her rocking horse/lamb! I really like the one from Cookie-maybe the traditional look will give you more room to play with colorful accessories? I think the yellow is gorgeous if you're feeling bold enough - maybe it could be used for a feature wall, and the others painted in something a little more mellow? Other than that I like the first one!